1. Shot Maharam of Rottenburg, by Rabbi Meir bar Baruch of Rottenburg. Printed by blue paper, rare and quality, printed by David bar Zvi, Sadilkov 1835. 2. Shot Meir Einei Chachamim, by Rabbi Meir bar Gedalya, a sage of his generation and rabbi of Lublin and Krakow. 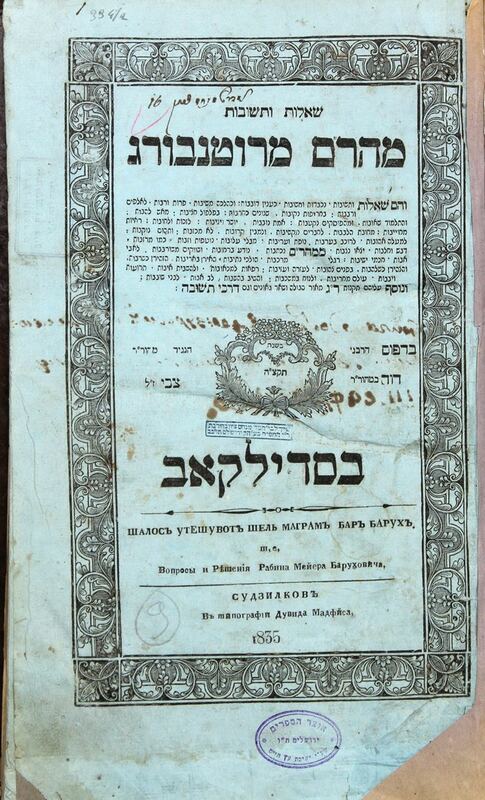 Printed by Yitzhak ben Eliezer the Printer, Sadilkov, 1834. Listings and stamps of ownership, moth marks, light restoration on the cover pages. New binding. | , 27, 25, 11 [supposed to be 12]; , 58 pages. 38cm. Generally good condition.